Our Collection Guide will help you navigate our Semi-Custom Collection process and the customization options available. We encourage you to read and refer to this guide while preparing to submitting your invitation order. Please be also sure to read Terms & Conditions. Browse the 6 semi-custom designs here and select the design that fits your wedding aesthetic. Semi-custom designs allow customization options for paper type, printing method, envelope color and ink color. Moreover you can decide to add embellishments like wax seals, silk ribbons and envelope addressing. Request a quote by completing the Semi-Custom Questionnaire. I will gather some of the big details such as your wedding date and estimated budget for invitations. After I receive your questionnaire, I will send a quote for you to approve. Once you have approved the quote you will pay a deposit and fill out the wording questionnaire, so that I can start designing your wedding suite. I will create the calligraphy artworks and you will receive an initial proof of your invitation suite within 5 business days. Please review all of the information carefully and make sure the spelling is correct. After this first proof, if needed, one revision is included: this covers any changes to information and wording as well as ink color. Please note that once you have approved the second and final proof, no more changes can be made. Your design will be sent to print. Printing usually takes about 2-3 weeks depending on the printing methods. Any additional ornaments and/or envelope addressing will be completed after your invitations are printed. Once everything is ready to go the balance is due. Your finished invitations will be carefully packaged and shipped to you! Digital printing creates a smooth finish as the ink is deposited on the surface of the paper. Letterpress printing produces an elegant debossed impression of the design onto the paper, allowing you to feel the letters and illustrations on the paper. 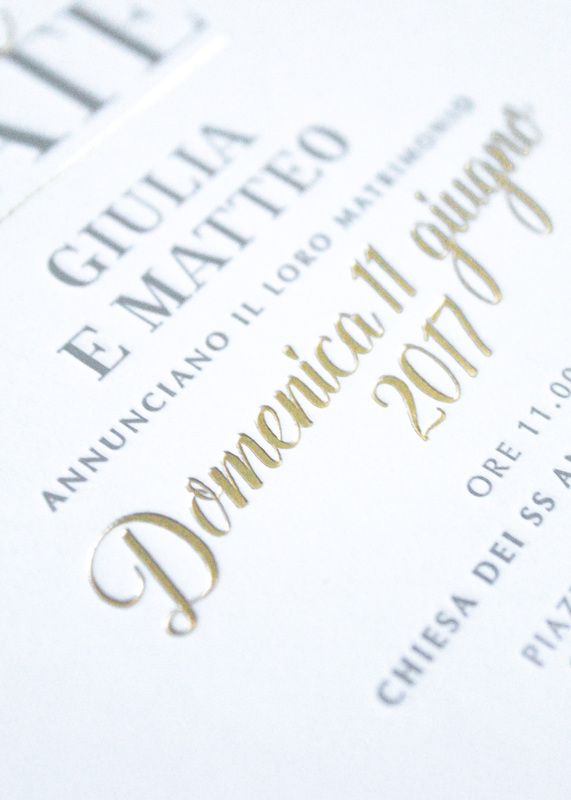 It gives a luxurious tactile element to your invitations. Foil printing is the process of laying a sheet of metallic foil and pressing it onto the paper with a metal plate. It is used for metallic colors such as gold and copper. Choose between 5 different types of paper, from cardstock to handmade paper. Cardstock is perfect for digital printing and features clean, smooth edges. Natural white cardstock has a softly textured finish while Floral cardstock features natural, deliberately visible inclusions and fibres. 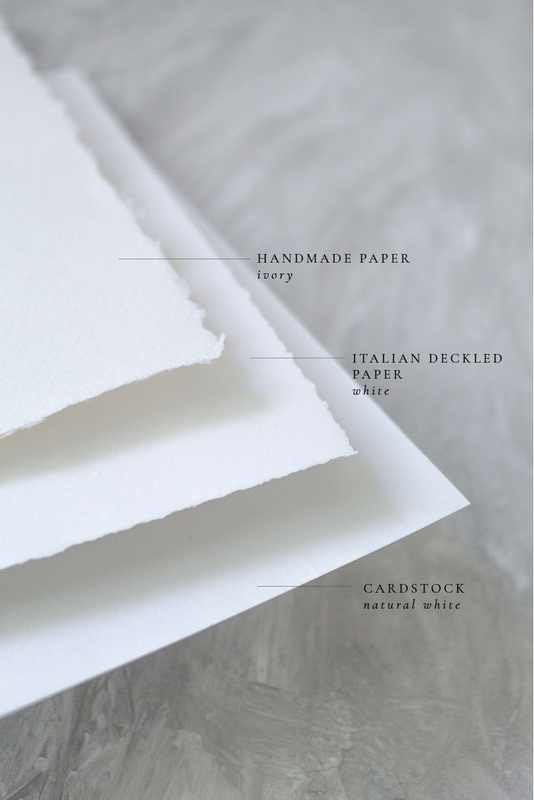 Italian deckled paper features deckled edges and a textured felt finish similar to watercolor paper. It pairs with white matching envelopes with the same finish. Handmade paper features an imperfect texture and organic deckled edges. Ivory matching envelopes , with square flap, are available but it also pairs well with cardstock envelopes. Choose between a variety of colors to coordinate with your unique color scheme. Our cardstock envelopes pair beautifully with all paper types including handmade paper. The colors below are available for Flat and Letterpress printing methods. * Please note: Paper, Envelope and Ink Colors may appear slightly different in real life. Also colors may vary from screen to screen.